All remaining candidates for the Republican nomination complain bitterly about debt levels in President Obama's budget proposals. Are their criticisms justified or just more pandering? Do their own proposals reduce debt in the long run more than the president's? In a word, no. The following chart appeared recently in Paul Krugman's N.Y. Times blog. The data are from the Committee for a Responsible Federal Budget. The bars show the projected national debt as a percentage of GDP in 2021. 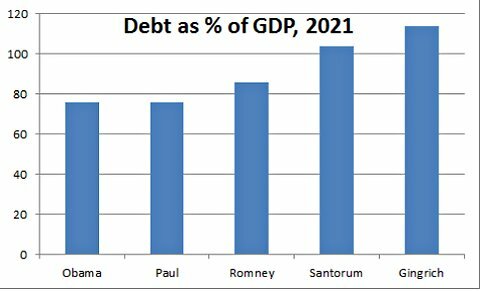 Three of the four Republican plans would result in higher debt than President Obama's. Why? Because they cut taxes for the rich, again. Oh, and for good measure, they actually raise tax rates for the poor and middle class. Only Ron Paul's plan scores as well as President Obama's, but it accomplishes that with Libertarian scale cuts to government programs that even his competitors for the Republican nomination wouldn't countenance, while still lowering taxes on the rich. Sound familiar? That's because it's more of the same trickle-down economics that has been discredited again and again over the past 30 years. The same Reaganomics that has increased income divergence and the wealth gap to Gilded Age levels. Republicans just can't resist tilting the economic playing field ever more steeply in favor of their rich patrons. Panderbear thinks it takes a lot of chutzpah to propose transferring even more wealth from the middle class to the already privileged rich. Don't bother showing this to a Republican....they'll never believe it! Yeah, I know. The facts are hard to swallow when they don't fit your narrative. The truth is, it's a lot easier to decrease the deficit if you just stop subsidizing the rich. Who knew?